Every new Pi Kappa Alpha initiate should receive one of these Keychains or Key Rings as a first gift. It's an inexpensive and highly useful present for members. The more keys you have to tote around, the more you need a sturdy keyring to keep them in order. You can fit about a dozen or so keys on the Pewter Key Ring. The wreath-like emblem featuring the Pike coat of arms is about the same size as the ring and offers a space at the bottom where you can add your first name or personal motto. 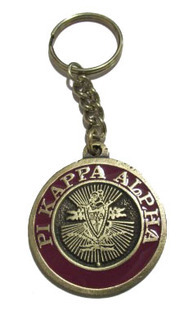 Our antique nickel fraternity keychain is elegant and looks a lot like a piece of jewelry. 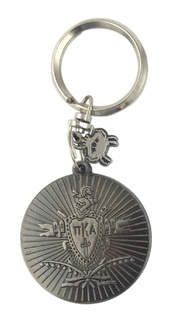 The Pi Kappa Alpha coat of arms is etched into the metal charm with close attention to detail. The 1868 founding year is highlighted on the back. You might decide that you'd rather use this chain as a decorative element in your dorm room or to hang from your car's rear view mirror. 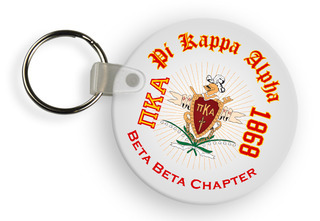 For a fun and simple gift to give a Pi Kappa Alpha man, browse through these nice looking Keychains and Key Rings. Rush options may be available for a small added fee if you need it fast. 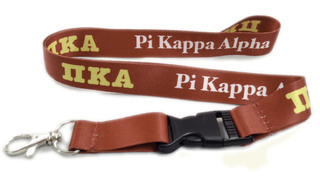 Pi Kappa Alpha Key Rings & KeychainsThe Greatest Selection. Period.